"Merce's Isosurface (2009: Golan Levin remixing Merce Cunningham + OpenEnded Group) returns a mortal coil to the disembodied datapoints of Merce Cunningham's LOOPS performance. Here, the digitally captured coordinates of Cunningham's fingers and knuckle joints are used to structure a smooth field of simulated energy. 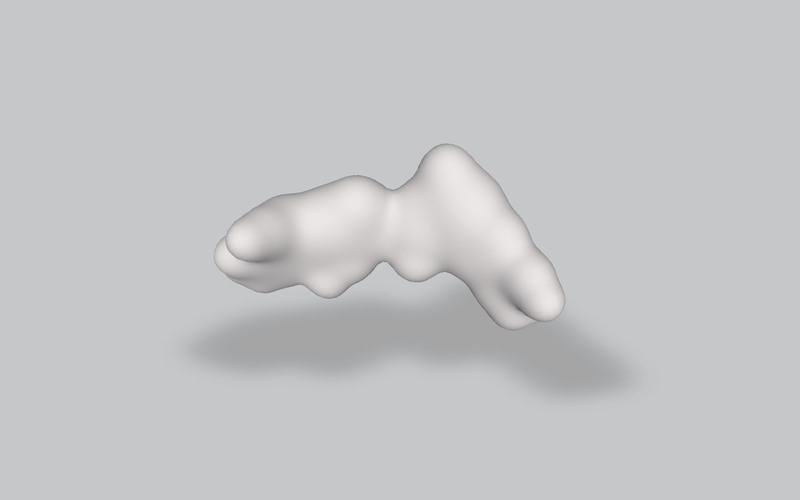 The result is a twitchy, fleshy blob, animated by Cunningham's own movements, which dances in the liminal territory between pure abstract form and medical information visualization." An isosurface is a surface representing points of a constant value within a volume of space. It creates a surface with the help of the marching cubes algorithm by intersecting the edges of a data volume grid, with the contour of the volume. At the sites where the surface intersects the edge, the algorithm creates a vertex.